Kristine Moore Gebbie is professor at the Flinders University School of Nursing & Midwifery in Adelaide, Australia. 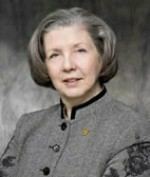 From 2008-2010, she was the Joan Hansen Grabe Dean of the Hunter-Bellevue School of Nursing, Hunter College-City University of New York. Before moving to Hunter College, Gebbie was the Elizabeth Standish Gill Professor at the Columbia University School of Nursing and Director of Columbia's Center for Health Policy. Dr. Gebbie is best known for being the first U.S. AIDS Czar, from 1993 to 1994, during the Clinton Administration. She was a member of the President's Commission on the HIV Epidemic, formed by President Reagan, and an outspoken opponent of the Reagan Administration policies on AIDS testing. Gebbie was a founding member of the National Board of Public Health Examiners, an entity that provides the first and only core certification for public health professionals and graduates of CEPH-accredited institutions. Before joining the White House, Dr. Gebbie was the Secretary of the Department of Health for the State of Washington (1989–93) and was previously director of the Oregon Department of Health. She earned degrees in nursing from St. Olaf College and the University of California at Los Angeles. She also holds a Doctor of Public Health in Health Policy from the University of Michigan School of Public Health, earned in 1995. She was pursuing this degree when she was named AIDS Czar in 1993.